VOA Special English - EDUCATION REPORT - Foreign Student Series: Public or Private? EDUCATION REPORT - Foreign Student Series: Public or Private? Today, in week four of our Foreign Student Series, we discuss differences between public and private in American higher education. A big difference involves money. Public colleges and universities charge for an education just like private schools. But state schools cost less because they get money from the states that started them to educate local citizens. As a result, out-of-state and international students usually pay more than state residents, at least the first year. The state with the most residents, almost forty million, is California. Its systems of two-year and four-year colleges and universities are among the largest in the world. But the example we are going to focus on today is to the north of California, in a much smaller state on the West Coast: Oregon. The University of Oregon, located in Eugene, is one of the campuses in the Oregon University System. The cost for undergraduates this year is six thousand dollars for state residents. Housing is an additional eight thousand. Nonresidents pay the same for housing -- but almost twenty thousand dollars for tuition and fees. Let's see how these numbers compare to a private college in Oregon. 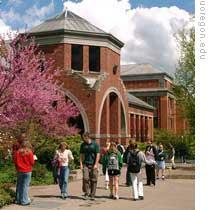 Lewis and Clark College in Portland has four thousand students, compared to twenty thousand at the University of Oregon. Housing costs eight hundred dollars more than at the state school. But the big difference is tuition. The published price at Lewis and Clark is almost thirty-four thousand dollars. Yet Lewis and Clark is one of the few American colleges to offer financial aid for international students. Each year it awards financial aid to twenty students from other countries. And it says the average award last year was nineteen thousand dollars. That would make Lewis and Clark cheaper for international students than the University of Oregon. But, of course, prices alone do not say anything about the quality of a school or the value of an education. And that's the VOA Special English Education Report, written by Nancy Steinbach. Our Foreign Student Series is online at www.unsv.com. If you have a general question about American colleges and universities, we might answer your question in our series. Tell us your name and where you are. Use the Contact Us link at www.unsv.com or write to special@voanews.com. perhaps lewis and Clark college is a good choice for international students. For foreign students or intertional students,their purpose going to America is to learn more knowledge on their major,so the quality of America universities and colleges is very inportant,but as a foreign student,how to know which university or college is better than other,that is how to compare the eduational quality among many universities and colleges. But，studying at a private college may cost much more money than at a public college, for a international student, it is too difficult to afford the tuition and other fees.